All of the saps, resins, and acids that remains in the pipe no matter how well the briar was dried or treated, are driven out of the wood. A cake, the layer of charred residue that builds up inside the bowl as tobacco is burned, is developed. The cake protects the bowl from the heat of burning tobacco and helps to absorb the moisture that results from combustion. Some manufactures coat the inside of the bowl with a protective coating of charcoal and other substances. I do not coat or stain the interior of my pipes. I found that if the briar was left to it's own resources and was dried properly, the pipe will smoke sweet and dry, providing it was made to exact specifications and with care. My pipes will break-in easily and smoke as well as any fine freehand pipe should ... giving you a pleasant, cool and dry smoke. So, how do you break-in your new pipe? Start with a full bowl of loosely packed tobacco. Some people will prefer to start with only half a bowl and slowly build it up to a full bowl over next few sessions. I'll leave it up to you to decide which is more natural for you and in the end it makes no difference to the pipe. What is most important is that you smoke slowly, making sure that the pipe does not over heat and that you do smoke all the way down to the bottom of the bowl. So fill your pipe loosely, sit back and enjoy your first smoke. Do not hurry. If the pipe gets too hot, just put it down, make yourself a cup of coffee or something stronger and let the pipe cool down. It does not matter if your pipe goes out, just re-light it and continue to smoke slowly all the way down to the bottom. Then loosen the grey ash with a pipe tool and covering the top of the bowl with your finger, shake the pipe a few times. This action will spread and deposit fine ash on the walls inside the bowl and will help to build up nice cake faster. I do not recommend that you coat inside of the tobacco chamber with honey or alcohol. Remove the remains of the ashes from the bowl, wait until your pipe has cooled down before removing the stem. Remove it turning in a clockwise direction. Clean the smoke hole in the stem and the inside of the shank with a good quality pipe cleaner and give your pipe at least one day before smoking it again. 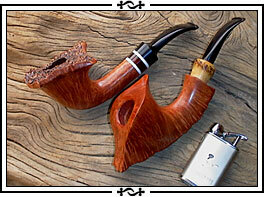 The rest periods are very important and a dry pipe will reward you with many years of pleasant smoking. Keeping your pipe insides dry is the secret to an enjoyable smoking experience. It is important to finish your smoke to the bottom of the bowl as this action will prevent moisture build up and stop your pipe turing soggy and sour. If you ever have any questions about your pipe, please do not hesitate to contact me and I'll be only too happy to answer any questions you may have.